Our upstairs 'en suite rooms' are the Aster, the Bluebell, the Marguerite and the Lavender (for details on these rooms, please see our main website). They each offer a new queen size eco-bed ensemble and en suite bathroom with shower. Our beds are finished with natural bed linen. Each room features pure wool carpet, TV/DVD, tea making facilities and has central heating. Tariff includes a full continental breakfast, free high speed wifi, complimentary port, cake, cookies and chocolate, and a library of books and DVD's. May be a 2 night minimum on weekends. For infants we charge for providing a cot. Please supply your own bedding for your infant. Not all our en suite rooms are suitable for infant, therefore please enquire so that we can accommodate your needs. The largest of our upstairs en suite rooms, the newly refurbished Lily is a delightful room with two large windows that let in the morning sun. Large queen size brass bed, and single bed for an extra person (additional rates apply). With TV and DVD player, and shower ensuite. Room has central heating. Tariff includes a full continental breakfast. 2 night minimum stay unless otherwise specified. Default configuration is for one queen bed for two people. If you require the additional single bed and the booking is for two people, please contact us as soon as possible. A surcharge of $20.00 per night will apply. If you are booking for three people, simply choose the necessary third person option. A surcharge of $50.00 per night will apply for an extra adult. For infants, a charge will be added if you require our cots or bedding. Please specify if you are bringing your own bedding for your infant. The Honeysuckle Deluxe Spa Suite is perfect for a romantic weekend getaway. Complete with a generous king size 4-poster bed, decorative Victorian fireplace, fridge and 32 inch TV & DVD. Situated at the front of the house with a large spa en suite with soaring ceilings. This suite has central heating. Tariff includes a full continental breakfast. Minimum 2 night stay, unless otherwise specified. This room is not well suited for an infant or a cot. This well appointed spa suite features a Queen size 4-Poster bed with drapery, and a working Victorian style gas log fireplace. Period furnishings and chandeliers are in keeping with a turn of the century guest house. The private sun room enjoys a north/east aspect capturing the morning sun and features a dining area, complete with fridge, microwave and tea making facilities. Relax in the large double spa and enjoy the cosy ambience of Kurrara. All rooms have central heating. Tariff includes a quality continental breakfast. Free high speed wifi, a variety of over 30 teas, cakes, cookies, chocolate and port, and DVD library. Minimum 2 night stay unless otherwise specified. The Magnolia Garden Spa suite is the perfect retreat for your romantic getaway. Complete with queen size 4-poster bed with drapery, chandeliers and period furnishings, double spa bath and 32 inch TV with DVD player. The private garden room is fully equipped with fridge, microwave and dining, and your own private entrance to our gardens. 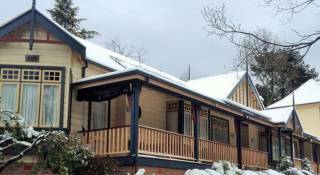 Kurrara Historic Guest House, was built in 1902 as the second guest house in Katoomba. 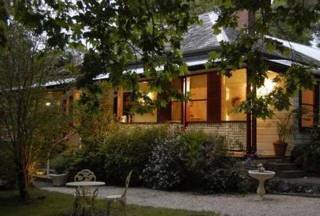 Run by Mrs Wilkins, manageress, as a 'first class establishment', Kurrara - meaning 'high campsite' - is a beautiful Victorian country home that embraces the history of the Blue Mountains, with its eclectic furnishings and architecture. Staying at Kurrara will transport you back to a time of old fashioned values, as you enjoy the modern day comforts that Kurrara offers. All of our 8 bedrooms have en suites, some with spa baths, romantic gas log fires and four poster beds. All rooms have LED/LCD televisions & DVD players. Sip a glass of port as you relax by the gas log fires in our Guest Lounges. Read a book from our library or watch a DVD. Free high speed wifi is available and will keep you connected to your world. Room tariffs include a quality continental breakfast for two. Off-street parking available. 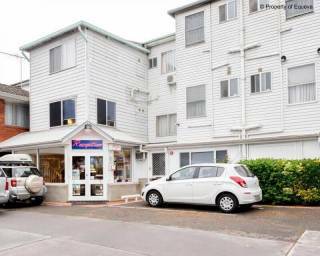 Kurrara is centrally located and within walking distance to the Three Sisters, Echo Point and Katoomba town centre. Close to bush walks, scenic views, and only a stroll to a variety of restaurants. ARRIVAL TIMES: Our check-in time is between 2.00pm-8.00pm. Late check-in will incur a per hour fee, Early check-in before 2.00pm cannot be accommodated due to our housekeeping schedule. Baggage drop is allowed by arrangement only. It is necessary to let us know your approximate time of arrival. If you are travelling from Sydney Airport, please allow 1.5-2.5 hrs travelling time. Available check in hours are between 2 pm and 8 pm. Arrivals outside of these hours must be prearranged, and carry a fee. For most of our rooms, the maximum occupancy is 2 persons (children included). Failure to notify us of additional persons in advance of arrival may result in a non-refundable cancellation. If we are able to accommodate extra persons, a surcharge will apply. We consider children to be persons aged between 2 years and 12 years. Children under 2 years carry no additional charge and are not included in the 2 person maximum, but there may be a charge for the use of our infant cot. Some rooms are not suitable for an infant's cot, so please check the room descriptions. We accept Visa and MasterCard only, with a 1.8% credit card surcharge. We do not accept American Express. Kurrara is a non-smoking property. Heavy fines will be charged for smoking anywhere in the house. We accept Visa or MasterCard, with a 1.8% credit card surcharge. We do not accept American Express. If cancellation is received in full or in part, with more than 7 days notice, a 30% administration fee is retained. If cancellation is received in full or part with notice of 7 days or less, and the room is resold, a 30% administration fee is retained and the balance refunded. If cancellation is received in full or in part with notice of 7 days or less and the room is not resold, the entire amount is forfeited. In the case of a 'no show' or last minute cancellation (within 24 hrs) in full or in part, the entire amount is forfeited. Travel west along the M4, merging into the Great Western Highway (GWH) upon reaching the Blue Mountains. At Katoomba, turn left onto Yeaman bridge (exit at the third set of lights, just past Katoomba train station) and cross the railway into Katoomba. At the roundabout, turn left (the first exit) onto Bathurst Rd. At the next roundabout, go straight (the first exit). At the next intersection, with the Metropole on the corner, turn right into Lurline St. Follow Lurline down past the Katoomba RSL (on the left, corner Merriwa St). The next left is Coomonderry St. Kurrara is located on the corner of Coomonderry St and Ada st. Our private parking lot can be accessed from Ada St, and the main entrance to the house can be found off the parking lot. If you're coming from the airport, a great tool to use is this link. Follow the highway to Katoomba. Turn right at Yeaman bridge, then follow as above. Take the Blue Mountains line from Central Station (Sydney Terminal) and alight at Katoomba. Exit the station - at the base of the ramp, turn right, up toward Katoomba St.
A taxi bay is located on Bathurst Rd, near the station, or you can walk down Katoomba St, turning left at Waratah, and then right at Lurline. Follow the last two points of above. Kurrara is only a few minutes drive from the station.